The City Council will consider adoption of the Mitigated Negative Declaration, Mitigation Monitoring and Reporting Program and Urban Greening Master Plan on April 4, 2017. 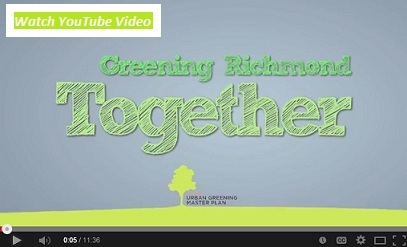 The Urban Greening Plan will serve as the master document to guide and coordinate future greening projects in Richmond. It includes a citywide tree inventory, an appendix for urban forest best practices, and a living list of approved street streets for the city. Richmond received a Strategic Growth Council Urban Greening Planning Grant to develop this citywide Urban Greening Master Plan (UGMP) in 2011. To learn more about this effort, click on the YouTube Video. In 2012, the City of Richmond received a California Department of Forestry and Fire Protection (CAL FIRE) Urban and Community Forestry Program Grant to update Richmond's Tree Ordinance (R.M.C. Chapter 10.08) and complete an inventory of city-owned trees, including street trees, park trees, and trees on city-owned property. The Citywide Tree Inventory was completed in July 2013. According to data from the inventory, Richmond has a total of 22,051 City-maintained trees and over 13,000 planting areas available for new tree plantings. Click on any of the zones below to search the Citywide Tree Inventory by address. In May 2012, Vallier Design Associates spoke at the Marina Bay Neighborhood Council meeting to update community members on the progress of the Urban Greening Master Plan and inform them on how they can include their community in the greening process. If your neighborhood council would like to host a similar presentation, please contact Jocelyn Rohan at Vallier Design Associates at (510) 237-7745. In March 2012, the City’s Planning and Parks and Landscaping Divisions hosted the Urban Greening Master Plan Project Kick-off at the Richmond Recreation Complex Social Hall located at 3230 Macdonald Avenue, from 9 AM to 12 PM. Participants learned about urban greening and its benefits. There was also a planting demonstration and an opportunity to participate in the first phase of the urban forest inventory process.